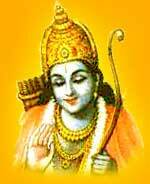 Is there anyone who does not know about Lord Rama? If you happen to be an Indian, and even more - a Hindu, it is impossible for you not to know of this supreme Hindu deity. Go through this informative article to know the identity of Lord Rama and how he is related to the yearly Ram Navami celebrations in India and abroad. If you love reading "Who is Rama? ", click here to pass on this interesting article to all you know. Enhance your reading pleasure on this Ram Navami. No Hindu is unaware of the life and actions of Lord Rama. Considered to be the greatest Hindu deity, Lord Rama is supposed to be the seventh incarnation of Lord Vishnu, the supreme cosmic power believed to be in charge of the preservation and protection of the world. A little research on Hindu religious texts shows us how Lord Vishnu arrived on earth in a human form to reinstate the principles of religion, morality and righteousness whenever an excess of evil threatened the existence of mankind. When Lord Rama was born, human race was experiencing a similar crisis. It is believed Lord Rama, or Ramachandra, descended on earth as the child of Dashratha, the King of Ayodhya, on an afternoon of the year 5114 BC. According to the sacred epic Ramayana, King Dashratha had three wives - Kausalya, Sumitra and Kaikeyi, none of whom bore a child to him. Even after several years of his marriage, the King was unable to be a father and he decided to hold a sacrificial ritual known as the Puthra Kamesti Yagna to please the gods that they grant him with a male heir. The efforts of the King was rewarded when all three of his wives gave birth to sons. Lord Rama was born to Kausalya, the eldest wife, who was the princess of the Kosala kingdom. Kaikeyi gave birth to Bharata while twin sons Lakshmana and Shatrughna were born to the youngest Sumitra. The four brothers grew up with an exceedingly loving bond between them. But while Rama bonded more with Lakshmana, Bharat enjoyed the company of Shatrughna more. Though there was great rapport between the brothers, Kaikeyi feared that Rama might victimize or even harm her son Bharat once he ascended the throne as Bharat was an immediate succesor to Rama. When King Dashratha grew old and announced the coronation of Rama, Kaikeyi reminded the king of a promise made by him to her long back that she could ask for anything from her husband and get it fulfilled at least once in her lifetime. She used this power to banish Rama to the forest for 14 years. With his wife Sita and the loyal brother Lakshmana by his side, Rama leaves the kingdom. A heartbroken Dasharatha fulfills Kaikeyi's promise but dies soon after at his seperation from Rama and the agony of passing such an unjust order. The obedient son that Lord Rama was, he conformed to his father's orders and passed his days with his wife and brother in a relatively less dense region of the forest. Despite hardships and difficulties, the three lived in peace in each other's company with Lakshmana taking good care of his brother and sister-in-law. But trouble began when Sita was kidnapped by Ravana, the evil monarch of Lanka. Forcibly taken away in her husband's absence, Sita remains in confinement and it was only a curse by Kubera's son that prevented Ravana from violating the woman's honour. Meanwhile the brothers form an army with the assistance of their friend Sugriva, the king of monkeys, and declare war on Ravana. The two sides engage in a furious battle for days and the mayhem ends when Lord Rama kills Ravana and vanquishes his entire army of demons (rakshasas). Rama frees his wife from captivity and returns victorious to Ayodha with Sita and Lakshmana after 14 years of exile. This event is still commemorated by Hindus during the "Festival of Lights" Diwali. Following his return, Rama is crowned as the king of the state. Under the reign of Ramachandra, Ayodha witnessed a glorious period with unparalleled progress on all fronts. To this day, Indians swear by the rule of Lord Rama and hope that their land becomes a "Rama-Rajya" (Land of Lord Rama) once again. Rama Navami commemorates the birth of this divine being who was considered to be the "Maryada Purushottam" or the ideal male. An ideal son, an ideal brother, an ideal monarch, an ideal husband and later an ideal father, Ramachandra is regarded as the person having all the supreme qualities that is looked for in a man.